The Curry/Del Norte Orchestra consists of volunteer musicians from the coastal areas of northern Del Norte County (CA) and southern Curry County (OR). Rehearsing once per week from September through April (with a break in December), the orchestra presents two annual series of three concerts each: one in early December and one in late April. Each series consists of a Saturday evening concert in Gold Beach (OR), a Sunday afternoon concert in Crescent City (CA), and a Monday evening concert in Brookings (OR). This photo of the Curry/Del Norte Orchestra was taken during its April 25, 2004, concert in Brookings, OR. 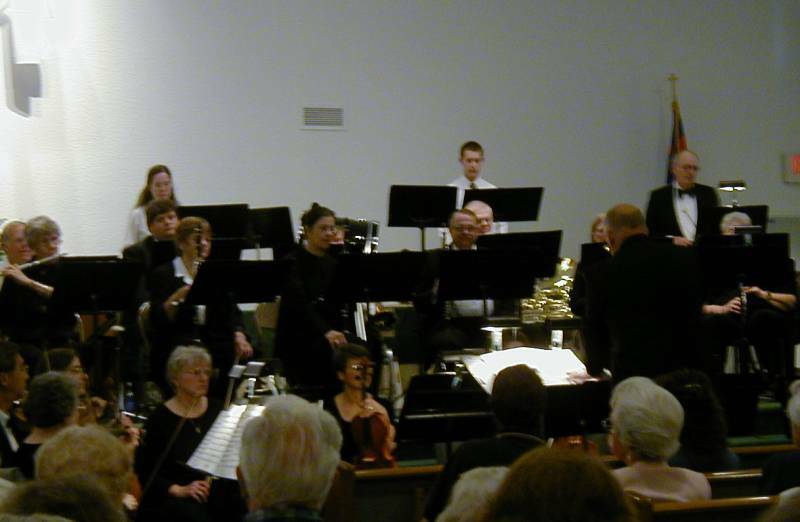 Conductor Gary DeRoest leads the orchestra while Yvonne on second trombone (difficult to see behind the clarinet player, but just in front of the black bass drum) and Norman on principal oboe (beside the clarinet player) await their turns to play. This photo of the Curry/Del Norte Orchestra was taken just prior its December 6, 2004, concert in Brookings, OR. Yvonne is at the far right in the second row and Norman, also in the second row, is somewhat to the right of center holding his oboe.